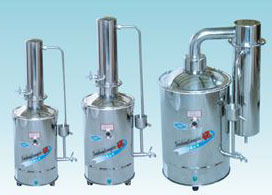 The pure distilled water is one of the most useful liquids in the hospitals, healthcare centers, research institutes and analytic laboratories This still is specially designed for these places to prepare the pure distilled water will be produced through this apparatus as the quality of the raw water supping into the still meets with the specifications of the drinking water of the city. This device can be mounted on wall, and producing the distil water in lower cost, continuously, automatically and effectively.Operation: The tap water enters the bottom of the condense pipe and circle along with the pipe and enters the vaporize pan in the end, the height of the overflow be pre-set. The steam in the pipe go down and meat the water go up, thus to make the gas in it.The steam produced in vaporize pan reached the condense pipe through guide plate. The guide plate be installed as can change direction three times before the steam enters the condense pipe. This way can protection of bring tap water in the distil water, the tap water bring in the distil water is the main cause of chemical of distil water worse. If the working is normal, it can get the water of fyrogen-free. The vaporize, condense, overflow and guide plate inner are made in stainless steel. And the cover outside and the cover of guide plate are made in heat-resistant borosilicate glass, all the electric elements with safety cut off switch. This series apparatus takes tap water as water source to produce pure water by mode of electric heating distilling. The water quality conforms to the standard of 《China Pharmacopoeia》(95). With reasonable structure & reliable & easy operating, the product is ideal for hospitals, pharmaceutical factories, & labs. Etc. 1. It's all made of high-quality stainless-steel materials & by advanced technology. 2. Condenser is made of seamless stainless-steel pipes and so with very good cooling effects & great capacity of water produce. 3. The immersing electric-heating tube makes high heating effects & long lifespan. 4. The cooled water returning to the heating drum can save energy & water. 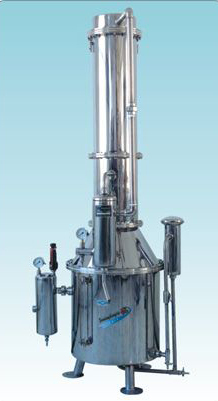 This series apparatus takes tap water as source water to produce high pure water by mode of electric-heating double-water distilling. It's ideal for clinics, hospitals, laboratories, pharmaceutical units and foodstuff use, etc. This series apparatus is easy to operate with flexible and simple operation system. 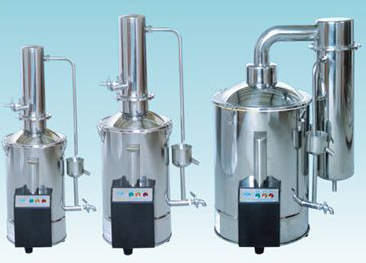 It's speciality is the product is will made of 1Cr18Ni9Ti fine and specially treated stainless-steel material, which not only ensure the good quality of the distilled water. But also loner the life-span of the apparatus. 1. It's made of high quality stainless-steel materials and by advanced technology. 2. Condenser is made of seamless stainless-steel pipes and so with very good cooling effects and great capacity of water produce. 3. 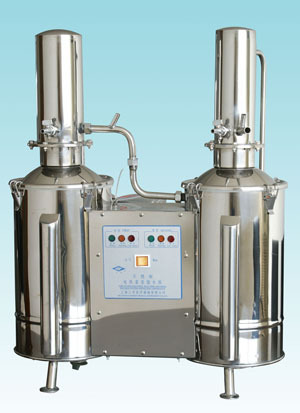 This product is composet of first distilling, second distilling water and heating two control system. 4. The immersing electric-heating tube makes high heating effects and long lifespan. Condenser is made of seamless stainless steel pipes and so with very good cooling effects and great capacity of water produce. The cooled water returning to the vaporizing drum can save energy and water. Drain valve can push the water in container, prevent bilge. When lack water will auto stop heating when the retur water reach the ormal level then continue heating. Immerge electric heating tube made from copper heat efficiency is better. Taking boiler steam as heating source and distilled water first time from the evaporating tube as water source, and tap water as cooling media, the apparatus products high-quality pure water by twice distilling. The water quality conforms to the Injection-water grade of 《China Pharmacopoeia》(95). With reasonable structure, reliable performance, berutiful outlooking, & great water producing capacity, easy installation & operating, it's ideal for clinic, pharmaceuticals, chemicals & textiles, & even electronic fields. 1. It's all made f high quality stainless-steel materials, which is anti-acid & base anticorrosion & easy to be scourred. 2. The apparatus is composed of steam-filter, evaporator, water-replenish, condemser & re-cooling tower. Every part can effectively achieve ammonia removing filtering, & seperating water from steam, thus ensure high-quality of distilled water produced.